This entry was posted in Birds and tagged Cerro Osa, Conservation, Costa Rica, Friends of the Osa, greg gund conservation center, Malacoptila panamensis, Osa Peninsula, Piro Research Station, Tropical Birds, White-whiskered Puffbird. Bookmark the permalink. I’m glad you guys love puffbirds as much as I do. I was thrilled to see the white-necked and white-whiskered puffbirds on my last trip to the Osa. 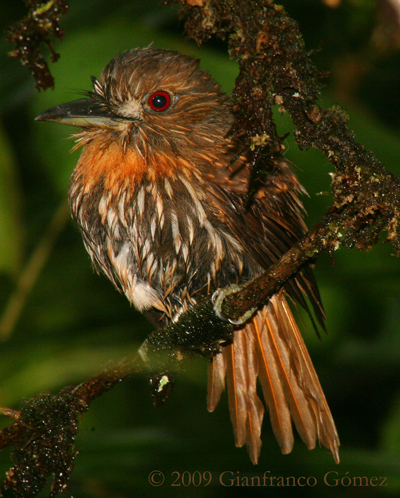 The white-whiskered puffbird was just as you describe: perching on a low branch in the underbrush. It was at the edge of a dirt path, probably prime flycatching territory. Thanks for this great profile! Hi Alan. Thanks for your support of Osa birds and their stories. Your a vital part of each post! Thanks again.